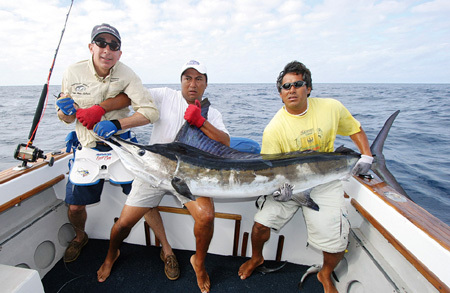 A brand-new tour service lets anglers explore the Galapagos Marlin Fishing. The sun had just crept over the horizon and four of the biggest trolling lures I have ever seen left smoke trails through the wake of our boat. In the distance, a beehive of seabirds hammered an acre-wide patch of the surface. Then the port line exploded from the outrigger and peeled off the reel. Not long after the hookup we had a blue marlin that looked all of 450 pounds at boatside—one of eight marlin we released that day. We were in the Galápagos—the last great marlin frontier in the world. I visited the Galápagos with IGFA representative Pete Santini, who first came here in 2004. Santini joined forces with local fisherman Gustavo Hernandez, and the two started Gustavo Tours, one of the few charter operations that lets anglers enjoy this practically untouched fishery. Guests stay on the island of San Crist—bal, in Ecuador, where hotels are abundant, clean and moderately priced. From there, they board the Sea Hands, a 33-foot “marlin-fishing machine,” and head to the waters where it’s not at all uncommon to have 30 marlin strikes in one day—250-pound stripies, 500-pound blues, even near-grander blacks…and don’t forget about bonus shots at yellowfin tuna. 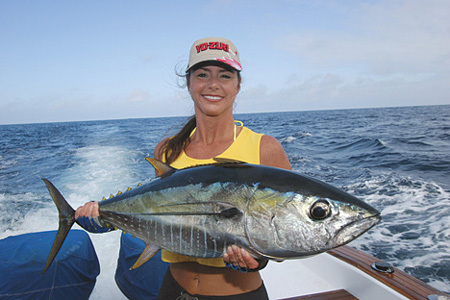 For details, including charters, accommodations and fishing seasons, visit World Explorer Notebook at www.wexpl.com.